Steeplechase jockey Cassie Hinton's dream was to walk down the aisle in her medieval wedding gown to become Mrs. Jack Chambers. Injured in the Grand National, she returns home...only to find Jack is now the Pastor of her parent's church. Jack Chambers, now a widower and single parent, still has feelings for Cassie, but she sees him as nothing more than a Pastor. Even if he could change her mind, there is still his position to consider. 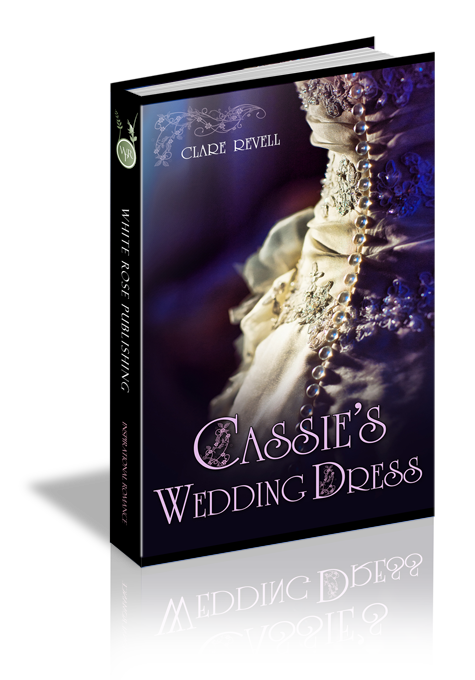 With the Royal Wedding fast approaching, Cassie makes her dress, little dreaming of the consequences of doing so. “All right, miss.” He nodded and headed down the line checking the other horses. Cassie took a deep composing breath in a vain attempt to soothe the usual pre-race butterflies filling her stomach. As the gate opened, butterflies vanished, replaced by exhilaration and adrenaline as Jeremiah’s Fancy flew from the gate like a bullet from a gun. Cassie rose in her saddle, leaning over the horse’s neck, whispering encouragement. They leapt the first fence, landing hard but safe on the wet ground. In her peripheral vision she saw someone to her right fall. At the second fence, the horse in front of her fell. She had seconds to react. Pulling up sharply on the reins, she managed to jump both fallen horse and rider, landing safely. The rest of the fences passed without incident until they reached the big one—the Chair. Other than Becher’s Brook, this one fence worried her the most. A prayer of thanks rose from her lips as she landed safely and set off around the course for the second and final time. Seeing the creek approach, Cassie tightened the reins, and pulled into the lead. Jeremiah’s Fancy took off perfectly, but his left back leg clipped the fence, throwing off his timing and he misjudged the landing. He tumbled back down the ditch into the water. Cassie didn’t have time to scream or react as she flew sideways, falling with the horse. Pain exploded as she landed face down in the water, the full weight of the horse on her leg and side. The horse scrambled to his feet, jerking her head from the water as he stood on her leg. Cassie screamed, dimly aware of horses landing above her. It seemed like an eternity before a hand gently cradled her face and someone else led the frightened horse away. “You’ll be all right. I’m going to give you something for the pain. We’ll have you out of here in a few minutes,” Dean told her. Hands fastened a collar around her neck before slowly lifting her onto a board. “Is Jeremiah’s Fancy all right?” she asked, trying to raise her head. Cassie nodded, closing her eyes. She’d be fixable, horses weren’t. The spring breeze lifted Cassie’s short dark hair and blew it into her eyes as she limped outside her brother’s fabric and craft store into the warm sunshine. The bunting flapped in the wind above her as the council workmen hung it from lamp post to lamp post. The whole town— the whole country, was going all out to celebrate the Royal Wedding of Prince Edwin to Lady Rebekah, with every shop front being decorated. She’d promised her brother, Danny, the best store window wedding display in Headley Cross. She slid a hand through errant curls and tucked them behind her ear. Taking a deep breath, she stuck hands in the pockets of her full, ankle length skirt and cast a critical eye over the window display. She tilted her head and screwed up her nose. It looks tacky—and the same as all the others. Two hours’ work down the drain. Scrap it and start over. Second time’s the charm…or is it the third? Cassie turned, recognizing the voice instantly. Pastor Jack from church. The scrawny ginger kid she’d grown up with had become a fit, attractive man, with broad shoulders and narrow hips—if one could think of pastors in those terms. “Yeah, I remember.” But that was years ago when we were kids. You were Danny’s best mate, and I hung around with you because I had a massive crush on you. A crush she was far from over if her reaction every time she saw him was anything to go by. And now you’re my pastor.